TUK Candy Hearts Print Heels - Women's Size 8 - Pink/Multicolored NEW! Length (Heel To Toe): 10.25". Insole Length: 10". Width: 3.25". Red sole with Mon Coeur engraved into shoe bottom. Inner sole and outer sole leather. Padded foot bed. Label: haan. width on bottom ball:3. 100% authentic! Stunning shoes! When you are finished, you can check out. view the pics! Size: 40 EUR ( Footbed 10.50" ). Retro-inspired suede heels featuring a square toe and contrast leather panel in back with a high block heel. • Block chunky wrapped heel. • Square toe. Heel Height : 4". Stunning shoes! Pretty color! When you are finished, you can check out. We believe that pictures speak louder than words and do our best to show several photographs of each item, including any flaws we find. Crepe elastic upper/leather lining/rubber and leather sole. A chunky heel with a mirrored edge lights up the sleek silhouette of this understated yet sophisticated pump. 2.75" heel. Slip-on style with elastic side goring. Sz 10M, See Photos for Condition. Style Young At Heart. Color Black. Heel Style Wedge. Outsole Material. Shaft Height. Shaft Material. Upper Material. Barely broken in without notable signs of wear. Well cared for, clean, comfortable quality shoes. Material Inside and Outside: 100% Fine Quality Soft Italian Leather. Color: Brown with Pale Leather Khaki-Mustard Inside and Outside Trim. Minor wear to the footbeds and soles of the heels. FLUEVOG HI CHOICE VANNY HEELS IN SOLID BLACK. SUPER RARE. Strong analine leathers, threaded trim, ring and strap detail, and a 3" leather wrapped heart shaped heel that leaves love prints wherever you walk. New new classic blue navy blue heels, size 11 M, need more photos ask?. "HEARTFUL". BLACK PATENT CORK WEDGE SLIDES SLIP ON SANDALS SHOES. Kate Spade Suede Genny Platform Pumps Heels Red Heart Size 5 B. Shoes do have some signs of wear. Nothing major. Lots of life left. Charming heart ornaments the topstitched vamp of a romantic peep-toe pump fashioned in brightly hued suede and lined in soft metallic leather. Approx. heel height: 3 1/2" with 1/2" platform. Suede upper/leather lining and sole. From dress shoes and boots to athletic wear and sandals. Diva's Emporium combines a superior selection of products with unrivaled service. These shoes are still in good condition. Order form or invoice must be included in the box. 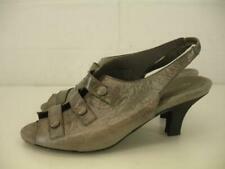 GREAT PAIR OF SHOES BY MARC FISHER, SIZE 7 M, GOOD QUALITY COMFY, COMING FROM ANY ODORS AND PETS FREE HOUSEHOLD. Mossimo Leather Heels NWOB. Excellent Condition -- box not available. Platform Height front: 3/4". Heel Height: 4.5". How we calculate our Pre Owned shoe size, we use the size chart printed on the shoe if available, if Not we calculate the size using our international size shoe chart mm. SIZE EU 37.5. OUR SIZE CHART. STYLE: Mules Clogs. DESIGNER: Brighton Jazz. Heart shaped diamond cut on instep. Make Supersized Seem Small. COLOR: Black. Black Leather Upper. LENGTH: 10.5" - From Heel To Toe. SIZE: 8.5 M.
SCALA Collezioni Red Suede Rhinestone Platform Heels Size 8 M. This is new without any box great and comfortable pair of shoes, top of the shoe is red suede, the bottom is man made material. The pair has a red rhinestones on toe and back areas. The shoes you see in the pictures are the exact shoes you get.